If Cake manages to leave us with any impression, it’s that Jennifer Aniston can, indeed, act. Sure, she may be Hollywood’s go-to actress when it comes to lesser rom-com territory – previously falling victim to films like The Bounty Hunter and Just Go With It – but as a dramatic actress, she’s really not that bad and she definitely gives what she can to her performance here. Shame, then, that the rest of the film doesn’t quite match up to her abilities – instead, we are given something that is overwhelmingly “eh”. That response is mostly down to the fact that the story is just not that engaging for audiences. Aniston’s Claire, a middle-aged divorcee suffering from chronic pain (so much so that she cannot even sit straight in a moving car), simply doesn’t have any dramatic conflict that sparks intrigue; it’s there, don’t get us wrong, but even then it’s very minor and not enough to get us to truly care about what’s going on. What’s more, the fact that she lives in a fairly decent Californian bode with a built-in pool and paid Mexican housekeeper (Adriana Barazza) gives us the impression that despite her weak physical condition she’s still far better off than most sympathetic characters would be. So, with that in mind, why should we truly care about the problems of a rich white woman when, by all accounts, it should be Barazza’s lowly character we should truly be focusing on? There could have been a much more interesting story if it was about Barazza’s character trying to take care of her boss in this condition, with Aniston in more of a supporting role as opposed to lead, but unfortunately the film gets it a little backwards. The narrative, for all its good intentions, doesn’t have any weight to it either, and comes across as more of a series of interconnected events rather than one flowing story. There’s a brief trip made to Tijuana, Mexico to secure some illegal pharmaceuticals to help Claire’s condition – she is shown to be a regular pill-popper – and when it looks like there’s going to be some dramatic tension, it’s resolved so fast and so conveniently that it’s frustrating when you realise nobody has learned anything from this. Going on around that is Claire’s growing interest in another chronic pain sufferer, played by Anna Kendrick, who committed suicide before the events of the film. She appears, in one of the film’s most contrived plot devices, as a ghost within Claire’s mind and consistently torments Claire about her actions, such as becoming friendly with Sam Worthington’s widow and his five-year-old son. If this was supposed to show a struggle within Claire’s own psyche, then it doesn’t work because we never see them interacting with each other while she was still alive and it’s implied that they weren’t even that close in real life. Nothing really connects to one another, and it’s all a bit disjointed and unfocused. The best part of the film, we reiterate, is Jennifer Aniston’s performance – she manages to bring life and melancholy to such a difficult character, and from what we understand about sufferers of chronic pain she is able to craft something authentic and meaningful to the unfortunate illness. The rest of the supporting cast, however, does not get as much of an opportunity to shine or even make an impression – Felicity Huffman, as an uptight support councillor, appears trapped in a thanklessly campy turn, and poor William H. Macy shows up for a maximum one brief scene as a vital character who is literally kicked off the movie as soon as he shows up. It’s clear that this is mainly a vehicle for Aniston to shine, so no room for some of these more established character actors even though they turn up anyway. 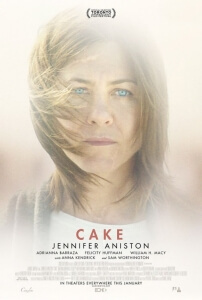 Cake works best as a showcase for Jennifer Aniston’s dramatic acting abilities, which are certainly put to good use here with her strong performance, but the rest of the film isn’t as engaging to watch and features one too many contrivances and loose narratives to truly be invested.